The Green Phone Booth: Stop Me Before I Pit Again! It's that time of year again. When the little red darlings of the farmers market beguile customers. Where their jewel tones lure the unsuspecting. Where one goes to pick up a few ears of corn and a bucket of blueberries and comes home with an overflowing box of red and gold goodness because the price was right. And that's what happened to me last week as I braved a breezy, sunny day to wander the local farmers' market. I filled my pull cart with the season's first watermelons. With pluots and nectarines. With lettuce and summer squash. And with 18 (count 'em) pounds of cherries. That's right. That's what impulse buys look like this side of green. More seasonal deliciousness than one could possibly devour in a week. And yet, clutching my cherry pitter (a gadget that anyone face this many pounds of cherries simply must own), I plunged ahead. I stirred up a tart little number. Cherry jam. Ruby red. Iridescent. 6 jars. 15 pounds to go. I made fruit salads for a BBQ with friends, a 4th of July celebration, every lunch, dinner and snack at the Bean household. The star of the salad? You guessed it! Cherries. 11 pounds to go. A bag pawned off on a family friend. 9 pounds to go. Whipped together some cherry vanilla cream soda for the 4th of July. 8 pounds to go. I went all foodie on the family with my homemade cream cheese cherry turnovers. (Recipe here). The family devoured my little beauties and I felt ready to take on the world, or at least the contestants over at Foodie Fights, but the looming box of cherries? 7 pounds to go. Declutter Cobbler, cherry style. 5 pounds. Cherry Chocolate Pancakes. (Ohhhh, yeah!) 4 pounds. Cherry coffee cake. 2 pounds. A full scale assault for lunch. 0 pounds. Free at last! Our local farmers' market was this morning. I packed my canvas bags and my shopping cart and headed out. It was a warm July day, sun streaking through the marshmallow clouds. I picked up corn, some early girl tomatoes. The pea guy was back. Blackberries peeked out of their green cardboard baskets. Watermelons lolled in the back of a pick up truck. I double checked my cart's contents. Local cheese. A baguette poked through the zucchini. Blueberries and nectarines lounged on top. Hm, I guess I've got it all. Scanning the blue and white umbrellas of the market, I breathed and headed toward the car. Or at least I intended to head toward the car. Somewhere, though I veered off course. I found myself in front of a trim red umbrella. A bright yellow sign. Cherries for sale. The older farmer smiled at me and held up a sample. My hand reached toward the cherries. The bings red as jewels. The rainiers sultry and golden. So beautiful. Tasting of summer and swimming pools. Cheaper by the box . . . Help!! Stop me before I pit again! My vices are strawberries and apples. Every year I end up with an absurd amount and wish I had shown some restraint. But they're so good! Major jealousy here on the east coast!!! Okay, here's what I do on a cherry binge. Wash them, stem them and pit them. Now huck them in the freezer. You'll be soooo happy you did when you are able to crank out cherry pies for the holidays. I just eat them non stop! If you serve them ice cold for dessert, they're the best! Sheeep: Yes! I know that the next time I go to the market and there are no cherries, I'll be devastated. Chile: Darn it!! Now I have to go and buy another box. Mom: Our strawberry season is REALLLLLY long here but I do admit to being guilty on the apple front as well. Crunchy: Okay, I've tried that before and they were all mushy when I thawed them out. Do I just drain them and then use them for pie after they are thawed or did I do something wrong? Abbie: Love it!!! Totally gonna try the recipe as I've yet to find an Abbie-special that wasn't delicious. Thanks for sharing. I did the same thing with beets last fall. 25 pounds of them. Still eating the last of them pickled. 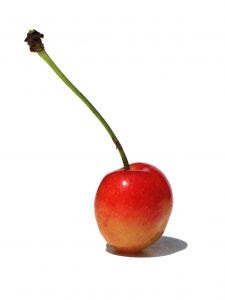 By the way, cherries can be pickled too. yuuummmooo!!!!!!!!!!! cherries are hard to get and grown down here, very short season too. Oh for a glut of cherries. Cherries stored brandy are fantastic! I make my own yogurt, and I love to add a little honey, then pour it over a bowl of cherries. Love! I'm picking cherries this weekend! Elizabeth: Yes, 'tis the season, isn't it? Of course, we enjoy it all come winter. Deb: Never thought of pickled cherries!?! I did debate on cherry chutney, though. Kel: They even have a short season up here. I wouldn't be surprised if they are gone at the next farmers market - which is why it is SO hard to resist them. Matriarchy: Cherry Custard Pie!!?!?! Now I really need to get another box. I got them by the 2kg box last year by ordering through the local school fundraiser. Thought I'd put some by for winter but every time I looked there were almost none left. There are TERMITES in this house!!! And they love my cherries so much I just divvied them into four parts and let the termites rule. Same thing happened to my apricots. viv in nz waiting anxiously for spring to come again. JessTrev: You're welcome to visit any time you like! Viv: "TERMITES" - that is hilarious! But so true. I love it when my kids gorge themselves on healthy stuff like cherries.